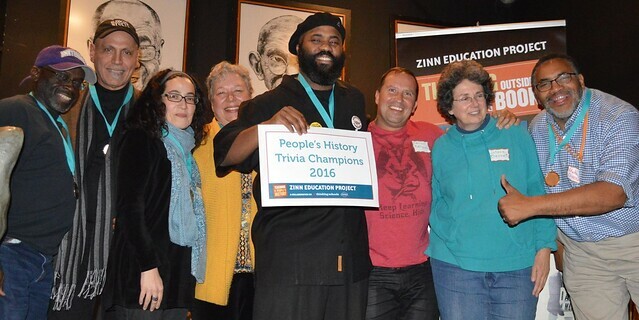 On December 2, the Zinn Education Project hosted a packed house for the first-ever People’s History Trivia Night. Scheduled during the National Council for the Social Studies (NCSS) conference being held in Washington, D.C., this fundraising event brought together people’s history teachers and friends from around the country including Hawai’i, Illinois, Massachusetts, Michigan, New York, New Mexico, and North Carolina. It was a lively night of laughing and sharing as everyone enjoyed themselves while learning non-trivial people’s history. The evening raised more than $1,300 for the Zinn Education Project. Scorekeepers Allison Acosta and Lauren Cooper tallying the answers between rounds. The Zinnstorians won with a score of 430 out of 450 points. Prizes given out throughout the night included free appetizers, a deluxe edition of A People’s History of the United States, Howard Zinn Speaks, Hands on the Freedom Plow, Not Just a Game, and, for the winning team, custom medals. Contestants formed teams, created team names, and responded to a series of questions. Team names included A Tribe Called Zinn, Zinnias, Trailblazers, One of Us Is Not a Teacher, and the Know-Nothings. There were three rounds of 10 questions and a final betting round of five questions with themes including Sports, Culture, Education, and Resistance. The event was co-sponsored by and held at Busboys and Poets (14&V). Teaching for Change staff organized the event with Allyson Criner Brown serving as MC. We hope to package this and have People’s History Trivia Nights take place around the country. Stay tuned! Below are a few of the questions from trivia night (answers are at the bottom of the page). We all know the name of Columbus, but what is the name of the Indigenous people who found him when he arrived lost on their island? This man could do it all. He was a star football player, lawyer, actor, singer, and speaker. His speeches against racism and for labor rights inspired people around the world. The 1912 textile strike in Lawrence, Mass., involved workers who immigrated from many different countries. The strike had another name—a name that came from a song—what was the name of that song? What island did Native Americans occupy for 19 months in a protest that began in November of 1969? See more photos in our Flickr album below.